This Cd is no longer available, having been re-mastered and re-released as Double Visions on the Floating World Records label. The first collaborative cd with acoustic guitarist Gordon Giltrap as Double Vision sees new arrangements by Raymond of some of Gordon's best loved tunes. This album features not only Raymond Burley but also respected acoustic guitarist Gordon Giltrap and the two different styles from these guitarists blend together very well. The two musicians have worked sporadically since 1998 and have recorded and played concerts together The material covered on this album reads like a virtual Gordon Giltrap retrospective covering as they do some thirty five years of Gordon's musical out put with key tracks such as Heartsong, The Raven from Peacock Party, and Isabella's Wedding, which was a track that appeared on Cliff Richard's successful adaptation of Wuthering Heights, Heathcliff. There is also a new piece of music included entitled Maddie Goes West. For lovers of guitar music everywhere this album will be a treat. DOUBLE VISION reviewed by Classical Guitar Magazine. Anyone who has doubts as to whether the amalgamation of nylon and steel string guitars and/or the partnership of a 'classically' trained musician with a supremely individual 'folk' artist would work, has only to listen to this glorious new recording from two players who are both widely recognised as being highly skilled individual performers in their own right. 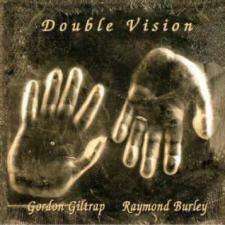 A fortuitous encounter between Raymond Burley and Gordon Giltrap in 2001, followed by a brief jam session, eventually led to the duo partnership Double Vision and some very successful concerts, including the Purcell Room at London's South Bank Centre, persuaded them to carry on the collaboration, the result being the release of this, their first CD together. Giltrap has been in the business for 35 years and the tracks on this album are representative of his output during that time, ranging from the late 60s with the intricate Fast Approaching through to the present day with the folky, highly catchy Maddie Goes West. Throughout, Burley has done a thoroughly magnificent job in writing the duo arrangements of these pieces - who would have thought the Giltrap classic Heartsong would have worked so well with another guitar part added? And their joint effort Ravensbourn has produced a wonderfully crafted work which stands alongside the best of them. When reviewing two players of this standard it seems almost an insult to state how well they perform but there have been fusions of top musicians before which have simply not worked for some reason or another. I'm happy to report that Burley and Giltrap gel so well in this enterprise that it would seem they had been playing together much longer than just these few years. This is a recording to savour and will surely satisfy classical and folk guitarists alike. Highly recommended.